There are many ways for nonprofit organizations and educational institutions to raise money. However, only one element of fundraising can literally double your revenue without asking your donors to shell out more money, and that is corporate matching gifts. What are corporate matching gifts? How do nonprofits collect matching gifts? How do we maximize matching gift revenue? Should we be using matching gift software? Keep reading to become an expert on corporate matching gifts! Simply put, corporate matching gifts are donations made to a nonprofit by a company or corporation that matches a previous donation made to the same organization by an employee of the company. Nonprofit eligibility: Most nonprofits and public educational institutions are eligible to receive matching gifts. However, some companies have narrower specifications of which nonprofits they will match gifts for, so it is important for a donor to have access to the specifications of their employer’s corporate matching gift program. Match ratio: The match ratio is the amount a company will give in relation to their employee’s donation. A 1:1 ratio means that a donor gives $25 and then their employer gives another $25. Companies set their own ratios anywhere between .5:1 to 4:1. Employee eligibility: Match ratios also vary from employee to employee. A part-time salesperson might be eligible for a .5:1 match ratio, while the CEO of the same company is eligible for a 2:1 match, meaning their employer will donate twice as much as they did to the nonprofit they support. Gift amounts: These programs also usually specify their own minimums and maximums. If the minimum qualifying donation is $25, a $15 donation from a match-eligible donor will not be matched because the donation does not qualify. Additionally, if a company’s maximum is set at $500, but a donor gives $1,000, the donation will be matched up to the maximum qualifying amount. The nonprofit has just turned $1,000 into $1,500! Program deadlines: It is also important for donors to know when their match requests must be submitted by. These deadlines are often scheduled around the end of the calendar year or tax season. Now that you know what matching gifts are and what elements to keep an eye out for, let’s talk about some stellar matching gift programs and their unique specifications. Plenty of companies offer matching gift programs to their employees. In fact, 65% of fortune 500 companies have matching gift programs. Though the list of companies that offers matching gifts goes on and on, let’s check out a few of the top programs. General Electric created the first matching gift program. Ever. In 1954, GE launched its GE Foundation’s Corporate Alumni Program. They matched employees’ donations at a 1:1 ratio because they wanted to build a culture of charitable giving. BP also has a great matching gift program. They offer great volunteer grants and grant stipends, but where they really shine is matching gifts. BP will match the straightforward donations made by their employees, as well as all of the funds raised by an employee in a peer-to-peer fundraising campaign. All of the employees working for or retired from brands under Gap, Inc., including Gap, Banana Republic, and Old Navy, are eligible for a 1:1 match. However, the maximums change based on superiority. Part-time employees are only eligible to match up to $1,000 per year, while senior Vice Presidents can have up to $10,000 matched. IBM is a great example of a company with more narrow specifications regarding which nonprofits they will match donations for. They specify that they will match gifts to educational institutions, hospitals and other healthcare institutions, and cultural and environmental organizations. Additionally, their current employees are eligible for 1:1 matches, while retired employees are eligible for .5:1 matches. These are just a few of the available matching gift programs out there. Fortunately, you don’t have to keep track of the details of all of these programs because there are programs that will do it for you. 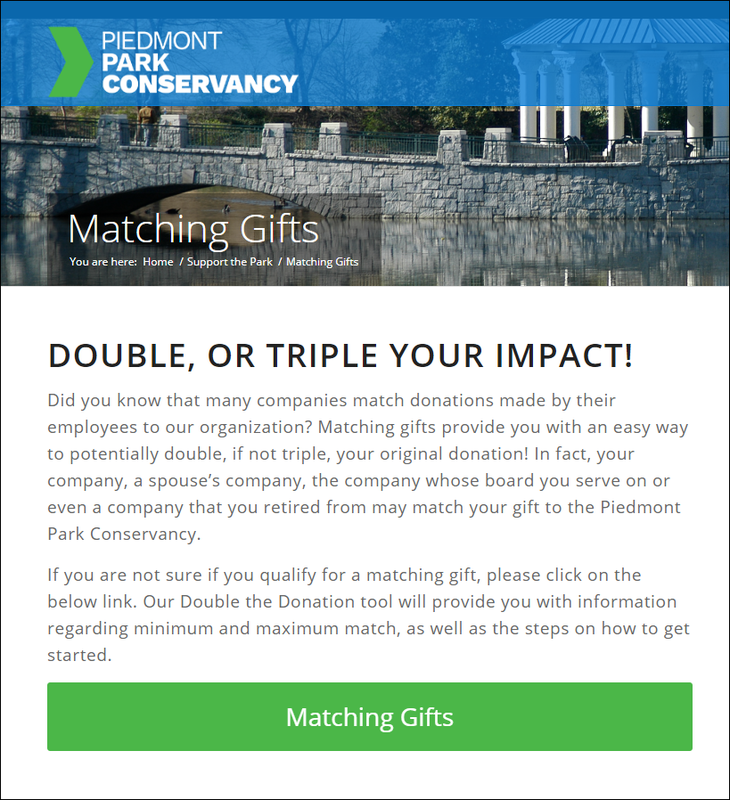 Double the Donation is a matching gift software that offers access for nonprofit organizations and educational institutions to a carefully collected database that includes 98% of all existing matching gift programs. How do nonprofits and educational institutions collect matching gifts? Though the specifications of matching gift programs differ company to company, the process for matching gifts is the same across the board. The first step is obvious: a donation must be made to a nonprofit. There can be no matching gift without an initial gift to match. After making the initial donation, the donor must submit a matching gift request to their employer for review. As we discussed, some programs specify exactly what type of nonprofit they will match gifts for, and they each have their own minimums and maximums. 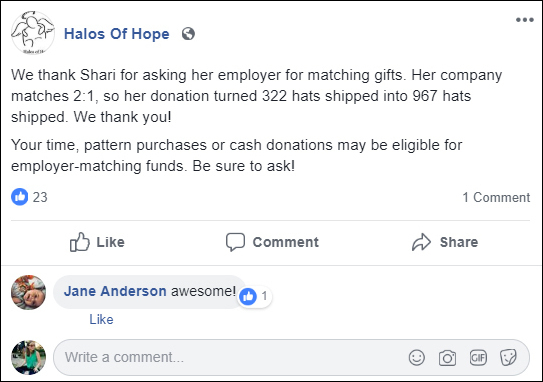 Once a company reviews a donation and finds that it is match-eligible, they will reach out to a nonprofit to confirm that the original donation matches the request. The final step is a nonprofit or educational institution actually receiving the check for the matching gift. The only part of this process that changes is how a donor submits their matching gift request. Some companies have a form in their online portal, and others have downloadable PDF forms. 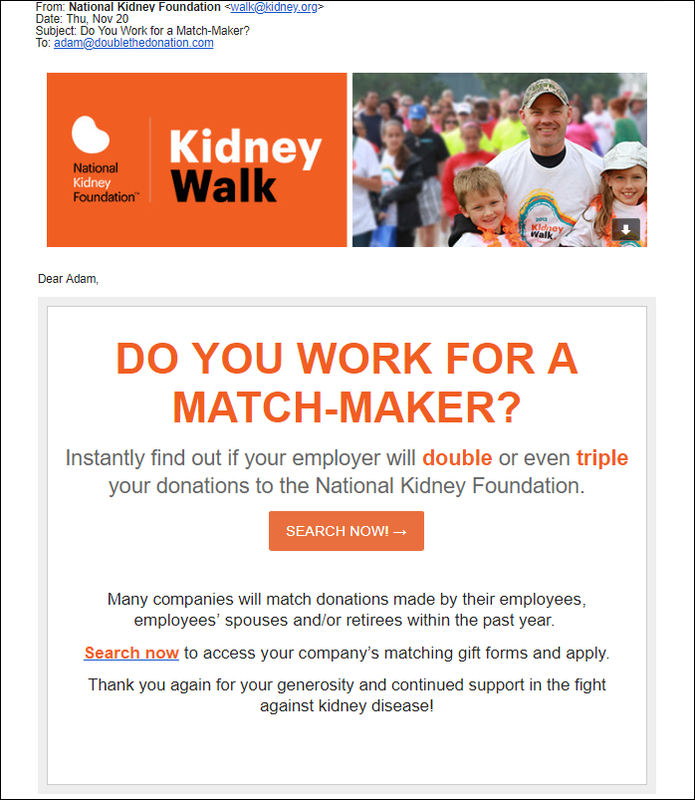 A software like Double the Donation provides the donor with exactly the forms they need or leads them to the page in their employer’s portal that allows them to complete their matching gift request. Corporate matching gifts are often included in employee benefit packages, yet employees rarely know the specifics of their matching gift programs or even that they are eligible for matching gifts. The biggest hurdle to increasing your matching gift revenue is lack of awareness. That’s why marketing matching gifts is so important. To be clear, the answer to maximizing matching gifts is marketing. Plain and simple. So what are the best ways to market matching gifts? There are several great ways to do it! Dedicated matching gift page: This is a page on your website designed to inform donors about what matching gift programs are and encourage them to check with their employers about potential matching gift programs. This page is also a great place to embed a search tool for donors to look up their employers’ matching gift programs on the spot. Social media: With Facebook, Instagram, Twitter, and LinkedIn, the world is more connected than ever. Use your social media accounts to spread the word about matching gifts and encourage donors to check their match-eligibility. You can also shine a spotlight on donors and companies who have successfully submitted matching gifts. This encourages the spotlighted donor to go through the process again and inspires new donors to claim that spotlight for themselves by getting their donations matched. Emails: When you send emails to your donors, you should always include something about matching gifts. It can be a quick reminder for donors to check their eligibility status written in your email signature, or an entire email dedicated to explaining matching gifts. 360MatchPro is a fantastic software that provides automated email follow-up to all your donors. This frees up time, money, and personnel to work on furthering the goals of your organization! Now we’re going to throw some numbers at you. Did you know that just by mentioning matching gifts in your fundraising appeal, the response rate goes up 71%. Plus, the average donation amount increases by 51%. There is $4-7 billion in matching gift revenue left on the table each year. All you have to do is ask for it. Your donors want to support you, you just need to show them how. In short, it depends. Whether or not you should be using matching gift software depends on how much you typically raise in matching gifts. Let's break it down! Note: If you typically don’t see any money from matching gifts, you do not need to be using matching gifts. If your organization is already raising between $3,000 and $15,000 in matching gifts, your best option is a simple matching gift search tool that allows your donors to find the programs that they are eligible for. With the basic plan, your organization is given a hosted page on doublethedonation.com. This page is branded to your organization and offers your donors access to Double the Donation’s database of more than 20,000 companies, subsidiaries, and spelling variations. Below is a mock-up of the hosted matching gift page your organization can build with Double the Donation’s basic plan. If your organization usually raises between $10,000 and $25,000 in matching gift revenue, you should be using an embedded search tool. With that much matching gift revenue already coming in, your organization would increase matching gift funds exponentially by embedding a matching gift search tool directly onto your website. With the premium plan, your organization is able to embed Double the Donation’s search tool right onto your website and link to that page in your email marketing, providing your donors with easy and immediate access to Double the Donation’s extensive matching gift database. Below is a mock-up of the embedded tool directly on your website. For those of you raising more than $25,000 in matching gift revenue, you should most certainly be using a fully automated matching gift platform. With that kind of revenue, there is plenty of tracking and follow-up that must happen before a gift is matched. 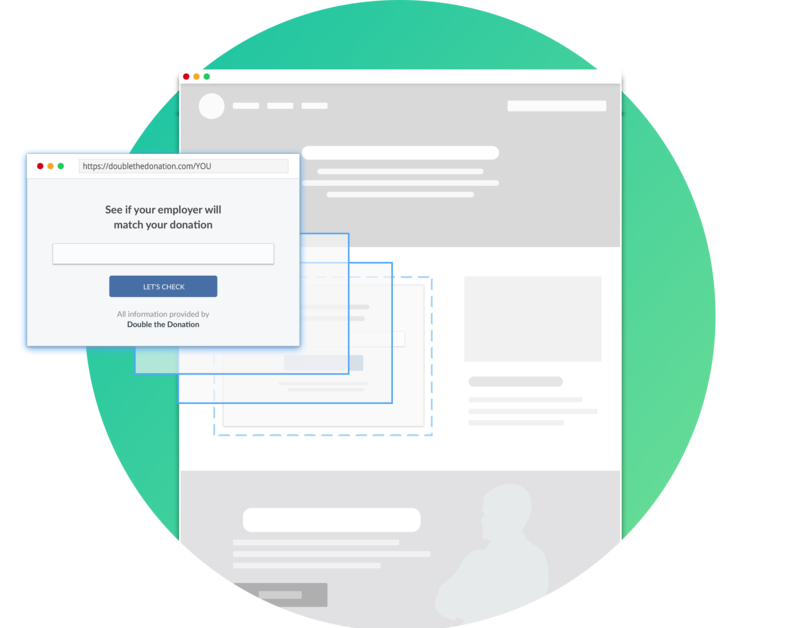 By fully automating the follow-up outreach, you will no longer need a full-time employee dedicated solely to matching gifts. 360MatchPro is Double the Donation’s most robust matching gift tool, and it fully automates the matching gift process from start to finish. It captures and stores donor information relevant to matching gifts, sorts donors by match-eligibility, and then emails each of those donors a separate stream of emails that provides details on their next steps for getting gifts matched. Below is an example of what your 360MatchPro dashboard might look like. 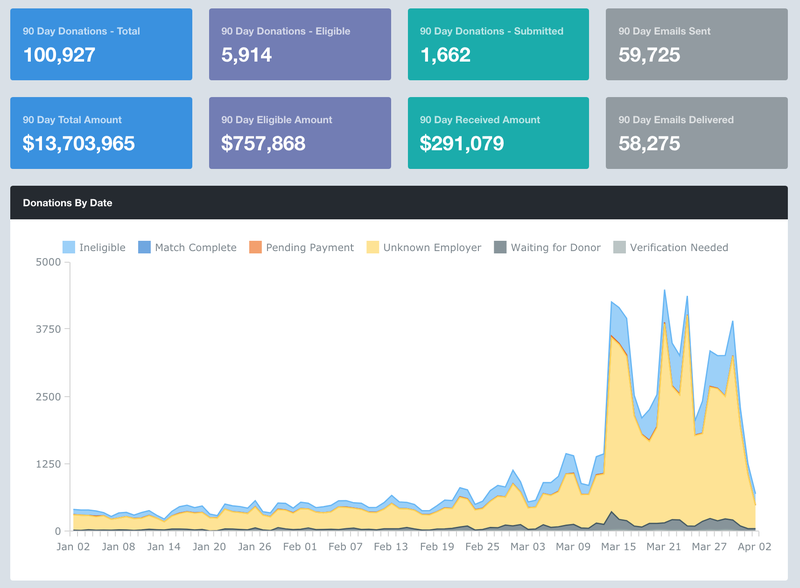 The platform provides actionable insights to help your organization enhance your existing matching gift program. To learn more, schedule a private demo of 360MatchPro! Rest assured that no matter which program you go with, as long as you spread the word about matching gifts to your donors, you will see an increase in revenue. We hope that you’ve learned a ton about matching gifts! You have learned what matching gifts are, how they work, which companies have the strongest programs, and most importantly, how crucial the marketing of matching gifts is for increasing your matching gift revenue. And with matching gift software, you will increase your matching gift revenue even more! For more information on matching gifts and boosting your revenue, come back and visit us at crowd101.com! Forget Crowdfunding, Get a Peer Loan Instead!